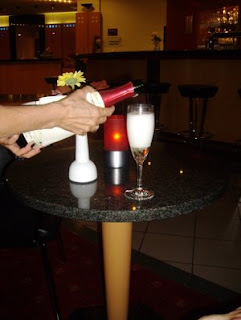 Enjoy - Food & Travel: InterCityHotel Schwerin. 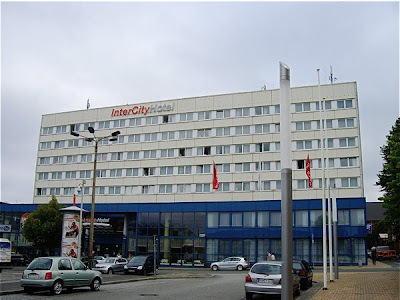 During our stay in Schwerin we had booked three nights at €79 per night at InterCityHotel Schwerin. This was certainly a nice price and we got good value for money. Hotel Intercity can only be described as good and not great. 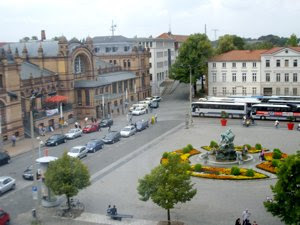 The hotel is located close to Schwerin main railwaystation. The area is a little run down, and not very charming. Very typical of most hotels with a similar location. There are few restaurants close by. As Schwerin is a small city, most restaurants are located within a 10 minute walk. 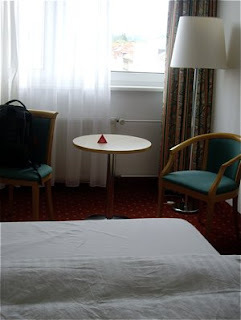 The staff at InterCityHotel Schwerin was professional and provided good service. I would particularly praise the staff at the reception. 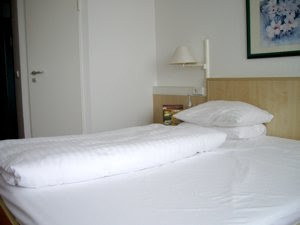 At EUR 79 a night InterCityHotel Schwerin was a great bargain compared to its price. Good sized rooms, with a clean and comfortable queen sized bed made for one. Spacious with a small table and two comfortable chairs. TV, minibar. Large closets to hang up your clothes and store away your luggage. In spite of this the rooms had two major flaws. The floors were covered with wall-to-wall carpeting that, combined with hardly any ventilation, could seriously affect guests with allergies. If opening the window (as I did), you would easily be disturbed by the traffic noise by the railway station. As the hotel is located by the Pfaffenteig, one of the small lakes, I was affected by something else - mosquitos. As I am highly allergic to these creatures, one night with the window open, more or less ruined my well being for the rest of the trip. The hotel is requested to change the carpeting overall (recommended) or at least offer rooms for allergics with no carpets. Spacious bathroom, elegantly tiled. Enough place for toiletries. Comfortable shower. Good lighting. InterCityHotel Schwerin offered breakfast included in the price, and what breakfast!!! This is probably one of the best I have enjoyed in a hotel ever. A wide range of products made the breakfast into a feast. For those needing a healthy breakfast there were fresh fruits, muesli and yogurt. There were cheeses, cold meats, patés, and mayonnaise based salads. I grew particularly fond of a ham salad and a cheese salad with oranges. And scrambled eggs, bacon and good German sausages - such a comfort the day after for those that have experienced a long evening on the bars of the city. If you wanted a sweet end to your breakfast - croissants with jam or why not a freshly baked pastry! The coffee, tea and juice were good too!! 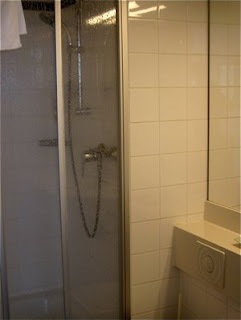 The InterCityHotel Schwerin did not offer much of facilities. The reception area was spacious but a little bare, and not a place to sit down for a cozy talk. There is a restaurant offering light meals and a bar at the reception. 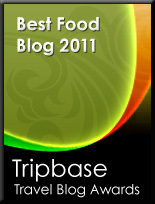 Good service and low prices, but it had no atmosphere. 79 Euros is absolutely no rip-off and even with the current standard the hotel is recommended as a good place to stay in Schwerin. 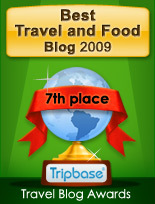 A few improvement in the rooms and the reception area would lift the rating further. Great breakfast!!! Enjoy Food & Travel recommends InterCityHotel Schwerin. Great breakfast but there are potential for improvements of both rooms and facilities.